A few months ago, we decided it was time for a keyboard upgrade for our developers. We decided to go with the Logitech G710 Mechanical Keyboard - and the results have been far from disappointing. Shipping standard with Cherry MX mechanical keys, this keyboard fits right into the role of quick and efficient coding. The keys are responsive, and with 110 anti-ghosting keys (allowing for multiple key inputs to be recognized by the system concurrently) we never miss a keystroke. With six programmable macro buttons, and three sets of macros, it allows for up to 18 macro functions to be set, from program shortcuts to keyboard inputs, and even full-length textblocks. This functionality furthers our efficiecy, using them for things like default layouts, document creation, and accessing certain applications at the press of a key. This keyboard is well backlit, and has the ability to toggle the lighting between 5 different brightness settings. The W,A,S,D and Arrow keys have separate brightness controls, which may appeal to gamers. The G710 has several built in media controllers as well, including a mute button, volume scroll bar, media player controls (start/pause, stop, forward, backward), and a "gaming" setting that disallows accidental keystrokes that may take you away from the application that currently has focus. Cherry MX Switches make the inputs very loud, which may not be optimal for some users. Lack of RGB lighting is unfortunate, but not completely necessary. Only supports white backlighting. Palm rest feels much cheaper than the rest of the keyboard, but suffices. 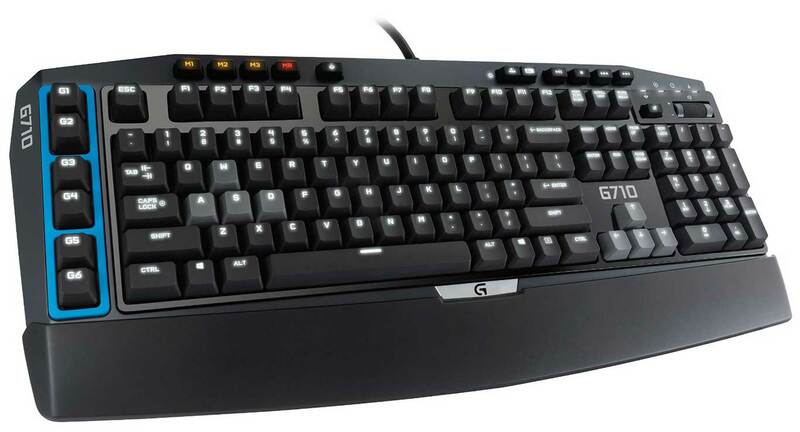 Overall, we believe that the G710 Keyboard is an apt product for the everyday computer user. Being mechanical, it not only is more responsive but also lessens the impact of medical conditions incurred by overuse of a computer (carpal tunnel, arthritis, etc). The Logitech G710 Mechanical Keyboard is a slightly older model, having released in 2013, but still stands up against some of the best in the industry for quality of build and performance. You can find more information, or purchase this product yourself, at Amazon or Newegg.